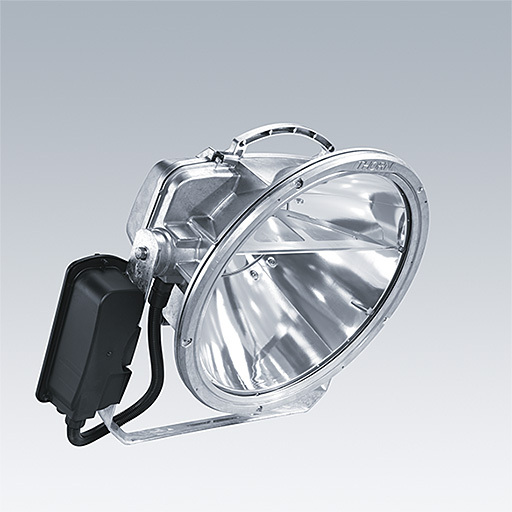 A high performance discharge floodlight for 1 x 2000W HIT-DE OSS lamp. magnetic. Class I electrical, IP66. Body and frame: die-cast aluminium unpainted. Enclosure: 4mm thermally toughened glass. Stirrup fixed by single bolt through Ø22mm hole, or 105x17mm oblong hole, or by twin bolts through Ø15mm holes. Cable gland for 8 to 12mm cable. Aiming via integrated sights. Ideal for sports field and stadium lighting. Complete with hot restrike ignitor box. Gear tray to be ordered separately. Lamp to be ordered separately.